Photographed when new, here’s a rare Gloster-Gardner coach, in Red & White Services livery, the company which collaborated with the Gloucester Railway Carriage & Wagon Works in the production of these vehicles. The robust chassis were fitted with overdrive and could achieve 53mph and 20mpg. The robust chassis were designed to take the Gardner diesel engine from the outset. In 1932/33, Red & White Services, of Chepstow, took delivery of six Gloster-Gardner 6LWs with GRC&W C30R bodies. Numbered 223-228, they were registered in the WO XXXX (Monmouthshire) series. 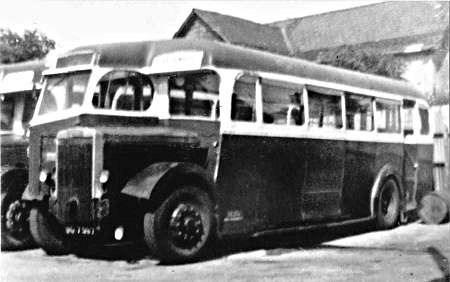 It is said that the unusual seven-bay bodies were not the most robust products and, in 1938, at least 223 was re-bodied by Duple as C32F as can be seen in the photo below. They were withdrawn between 1948 and 1951. Another user was Neath & Cardiff Luxury Coaches, who took two in 1934, one of which was fitted with a replacement second-hand body in 1946. Both were withdrawn in 1953. The range of chassis numbers between these two vehicles was 563, but such is the arcane nature of chassis numbering, that I remain unconvinced that that was the number of chassis built. 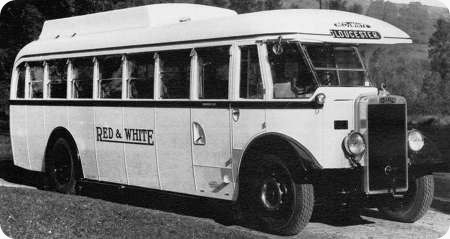 The production period was between 1932 and 1934, after which the company was busy with rail orders and this remained the only bus chassis the company ever built, although they built a complete trolleybus in 1933. Interestingly, Gloucester Corporation did not support their local bus maker, although their Vulcan Duchesses and Thornycroft BC’s did carry GRC&W bodies. What a very fine and purposeful looking vehicle! The radiator was particularly impressive and seemed to anticipate Leyland’s later style. It certainly compared very well with the SOS offerings of 1932! Chris B puts it perfectly! I imagine the gearbox was David Brown and the axles Kirkstall. Are technical details recorded anywhere? However troublesome the original bodies were, the Duple replacements were nothing like as good-looking–at least to judge by the lower picture–with that awkwardly-handled break in waistline and hackneyed swoop. Seeing "20 mpg" I assumed the Gardner was a 5LW, but on reading more carefully I was amazed to see such economy from a 6LW. How sad that the project was so short-lived and that there are no survivors. The nearest parallel I suppose is the Irish GNR-Gardner, of which I believe five survive. Thanks, Chris H, for a very inspiring posting. I’m glad I’m not the only one whose first impression of this vehicle was that it was a Leyland radiator! I’m inclined to agree with Ian that the Duple body doesn’t look quite right. The post war ones – as seen elsewhere on these pages – is clearly a "tidied up" version. A couple of further thoughts on this, I think I’m right in saying that the Gardner 5LW and 6LW engines were first trialled in 1931 so in these vehicles must have been some of the very first production examples of the famous Gardner LW range. Secondly, I’m particularly impressed by the style of the front wings. They give an astonishingly modern look to a 1932 vehicle and again they anticipated post war practice by a good fifteen years! I, too, admire the very advanced concept and styling of these Gloster Gardner vehicles. I have come across some references to these machines elsewhere in the past, but very little detail about the specification seems to be available. It does show that the Gardner LW oil engine, introduced in 1931, had established its credentials very quickly indeed. Ian is probably correct in his ideas of the proprietary components employed. Back in 1932, five speed transmissions were not that common – as far as I know, only Albion, Bristol and Dennis were offering these in the early 1930s, though I fully expect to be corrected by a better informed OBP stalwart. 20 mpg does strike me as being a bit optimistic for an overall performance figure, though I have no doubt that this was achievable on a long, steady journey. (Aldershot and District could almost get 16 mpg out of a 6LW Loline III on long runs.) The entire vehicle certainly exudes confidence and competence in ample measure, and the fact that they all had lives of around sixteen to nineteen years shows that such qualities were borne out in practice. It is strange that some of the other mainstream manufacturers did not learn from these remarkable vehicles. Several of the contemporary offerings were decidedly archaic by comparison. They are certainly original vehicles ahead of their time in may respects. I agree it is sad that the effort resulted in so few vehicles, none of which survived. Can anyone shed light on who Marston Coaches were and when WO 7518 was finally put to rest? I am intrigued enough with these coaches to go down to the local county archives to see if any newspaper items or GRC&W records survive, to get more information. I’ll keep you posted. 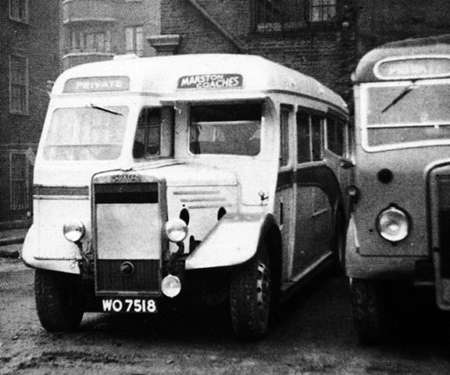 The Gloster had a two pronged purpose, firstly Red & White group was private at the time and wanted to take over the City of Gloucester Tramways and replace with buses, eventually this operator fell to Bristol Omnibus port of the Tilling Group, R&W hoped that the Glos connection and a promise of orders would assist the cause. The second reason was that R&W bought Albions and very good they were but as a very cost aware operator they wanted to switch to diesel engines and Gardners at that and Albion who were working on their own units were reluctant to house the Gardner, with the advent of the Gloster all that changed and Albion quickly came to heel and fitted various LW units for this good customer. Then 1934 happened and for the first and only time R&W went into a loss and that clearly caused a great deal of activity. The R&W Glosters had been sent to Liverpool where they worked on the McShayne service to London and I think this was given up, Black and White at Cheltenham was set up as a consortium, own services consolidated into the grouping and other changes made all of which brought the company into the black. In so far as I am aware there were 11 GG chassis, 7 to Red and White, 2 to Neath and Cardiff and 1 for Richmond of Neath all part of Red and White, possibly one not bodied and a Trolleybus using Compton equipment which went to Southend Corporation. Shame it was a great product with tremendous possibilities but one assumes quite expensive at the time. Thx, Christopher, for the additional background information surrounding these interesting and unique vehicles. I would feel pretty confident in saying that was an ex-North Western body and would not be the only one Red and White had. 671 (EU 8526) was a Griffin PS1 (originally 104) which carried such a body until a Duple coach body was later fitted. I also have a photograph showing another similar body (only) carrying the fleet number 310. David, I have EU 8526 (and 3 other Griffin PS1s) having been built with a Leyland B35R body. It was later fitted with a second hand Duple coach body from a withdrawn vehicle. I have a D S Giles offside view of it with original Leyland body which does not look like the body above. However I do have Red & White 310 as a 1936 Albion fitted in 1953 with a 1930s ECW B35R body from a North Western vehicle. Can you post your photo of 310 please.